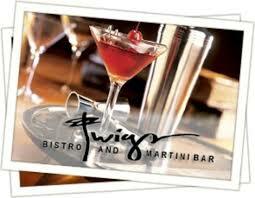 Our flagship Twigs Bistro & Martini Bar was opened in June 2001 overlooking the atrium at Riverpark Square adjacent to the AMC movie theaters. Balcony seating overlooks the atrium – open and inviting it’s a great spot for people watching. Meet before and after a movie, or in between shopping sprees in the friendly and lively bar which features imported silk chandeliers and a 40 ft granite bar top. A rotunda room with a full view of downtown Main Street can accommodate larger parties.